We were recently contacted by Arete Associates for updates on a couple of the interior signs in their office building. There are many different types of wayfinding signs, but they all have the same purpose. Signs, in general, are meant to help you navigate and find where you need to go. 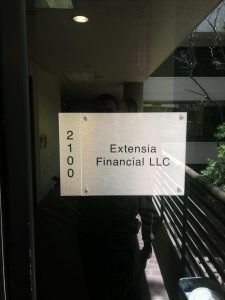 Directory signs are a great example of interior wayfinding signs in office buildings. 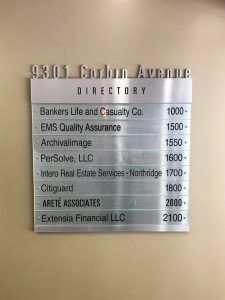 Arete Associates’ office building has a directory sign in the lobby that lists the tenants and their suite number. Each tenant is on a different panel, and they’re meant to be able to be switched out for when tenants change. Without a directory sign, companies would need to tell each person directions to get to the office. When the information is readily available right when they walk into the building, it makes things much more efficient. Another type of sign that is crucial for building with many rooms are room ID signs. Even if one building only houses one business, the different rooms still need to be labeled, like a hospital or a school. When each door is for a different business altogether, there is no way that someone could find the correct office without an identification sign. This is where tenant ID signs come in. Most tenant identifications that go on doors or next to doors in the hallway of an office building are made in similar ways. The sign consists of two parts. A backer panel with information that isn’t going to change, and a less permanent panel that can be changed out with new information if needed. The backer panel usually has the suite number in both tactile font and Braille. The second panel is where the tenant’s information goes. This panel can be removed without any damage to the backer panel, much like the directory sign panels.